NOW: I love my job. I wouldn’t give it up, unless I could stay off until my kids were in school and then just go back. But that’s not how it works with teaching. At least not here. We have two incomes to pay the bills. Yes, we do have some luxuries – two new cars, DVC so we can go on vacation, two state-of-the-art grills in my(Tim’s) backyard, a Zoo Membership. But all of these things benefit our children also. Now, that being said, there are some jobs (NOT teaching) that expect that you should just abandon your family if you want to get ahead. Last year, for the twins’ first birthday, they wanted to send my husband for training in Virginia Beach. He informed them it was his kids’ first birthday and he couldn’t miss it. They said that they had missed plenty of birthdays, and especially the first birthday; the children won’t even remember! Think George Banks from Mary Poppins. Luckily, Tim has watched Mary Poppins enough to know family comes first and did the training at another time. Last night, he had to work late. He’s salaried, but he still has a certain amount he should be getting done and it doesn’t always fit into his 8-4:30 schedule. Other people stay late. All. The. Time. Every day! Even if they have kids! I suppose maybe their kids go to bed later than 7:00, but still. I guess it’s harder for me to understand because I don’t have that kind of career. Tim doesn’t stay late that often because he wants to come home and see the kids (and me, I suppose). Every so often though, he has to stay late to catch up. So I was alone with the twins for the evening. I was outnumbered. 4 to 1 (you gotta remember the dogs!). And it was thundering, so Biscuit counted as extra dogs because she did not want to leave my side. She actually did not want to leave my lap, but I was standing, so she didn’t have a choice. I did not get many pictures before dinner. In fact, there are none. At one point, Ariel was screaming “POO POO” at me….so I checked her diaper. Nope. She kept it up, “POO POO, POO POO”, potty? I couldn’t really say no. I’m trying to teach her the potty is a good thing. At the same time, Will really was poopy. Ariel sat on the potty. I changed Will’s diaper in the bathroom. Biscuit was trying to climb in my lap. Griffin was barking from the living room because the twins had moved the dogs dishes in the doorway and he was trapped. And I had pots of steaming veggies on the stove top. Will ran away after his diaper was changed and brought Ariel some books to read on the potty. He is just SO SWEET, right? Then he, along with Biscuit, kept trying to climb over where I was blocking the doorway to the bathroom so that they could get in there. Patience is a virtue. I was also on my own for dinner. 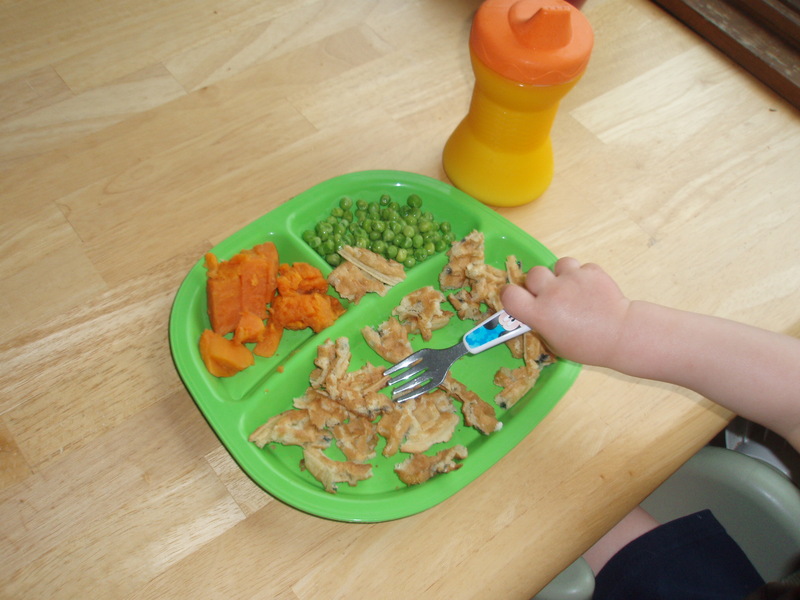 Ariel and Will were served sweet potatoes, peas, and blueberry waffles (previously frozen). I’m good with the microwave and toaster. 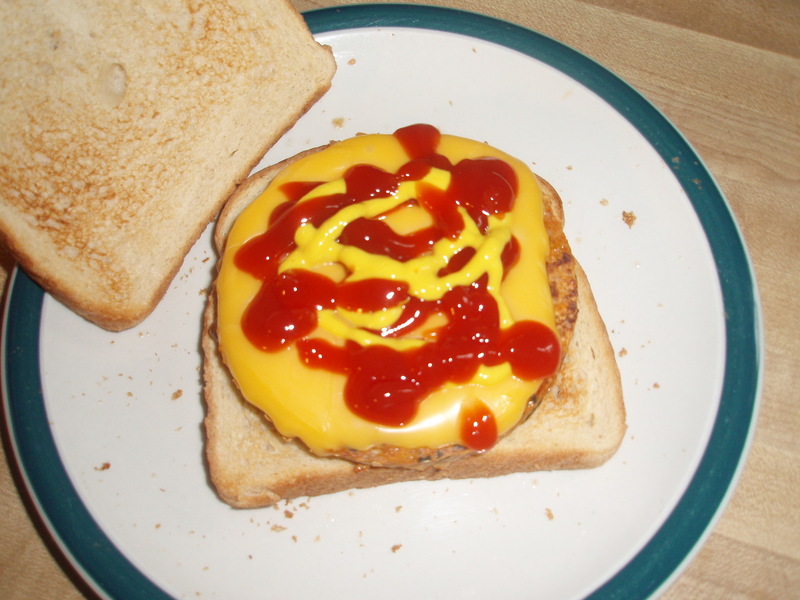 I made myself a veggie burger; added cheese and ketchup and mustard. We didn’t have any rolls so it’s just on White/Wheat bread (it’s Wegmans brand – it’s like White whole grain or something). I did toast the bread in the toaster. I’m high-tech. I only got to eat half of it though. Two weeks ago, we fed the twins veggie burgers and they wouldn’t touch it. When Mommy eats it and they don’t have it, it’s a different story apparently. So I had mostly bread. I also warmed up some “stuff”. It’s mock pierogi to all you Polish people. (I am Polish, but my mom makes it, and she is not). We nicknamed it Stuff when I was really little. There are many different ways to make Stuff. All of them bad for you. My mom’s is the worst. But it’s like the perfect food. I was going to ask her to make it on Father’s Day for our cookout, but Tim said that wasn’t a good idea because it’s SO BAD FOR YOU. So I didn’t ask. She made it anyway to surprise me. (I was secretly thrilled!). 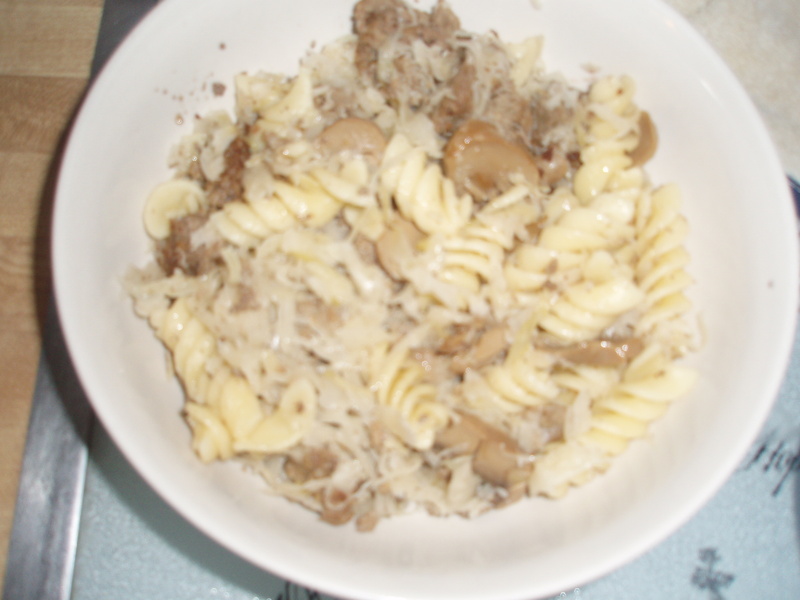 It consists of noodles, sauerkraut (see, I am Polish), mushrooms from a can, ground beef (although she probably used 90% fat free – that’s healthy, right?). And this time – drumroll please – 2 boxes of butter. No, that is not a typo. It was made in a big crockpot. But still. 2 BOXES of BUTTER. Even in small portions its hard to justify eating this. Except that it’s so good. And nostalgic. I threw the rest of the leftovers out. I felt so bad, but I knew it was the right thing to do. According to the Wii Fit – I lost 2 lbs today! I had supposedly gained 2 yesterday, so that’s a wash. This is now. THEN: The psychic. Do you believe in psychics? I didn’t. My MIL had gone to one in November 2008. The psychic apparently knew that her son (Tim) and daughter-in-law were trying to get pregnant and having trouble. She told my MIL to tell us to not worry. (Oh, OK, that will work, thanks lady I never met). She said we’d be pregnant by Valentine’s Day. As much as I didn’t believe, I didn’t want to believe, and I didn’t want to hope and wait for Valentine’s Day like it was some kind of deadline. I hoped she was right. I hoped it was sooner. I hoped Valentine’s Day wouldn’t come and go with nothing to show for it. My second round of injectables was at the end of January. Mid-January I got a text from my good friend telling me she was finally pregnant. (A text, I know, I couldn’t believe it either – but she wanted to give me time to digest the news on my own before I actually had to speak to her). I was so happy. I’m not lying or remembering wrong. Happy was my first and strongest emotion. I was having coffee with another friend and I called Tim right away. I was so mad she had TEXTED me with this big news. Was I a little sad for myself? Yes. But not more sad that I had been anyway. And it gave me hope. If she could try for two years and get pregnant, I could too, right? It was a little awkward when we saw a bunch of friends towards the end of January. They all felt sorry for me. I didn’t want them to feel sorry for me, I wanted them to feel happy for her. I know they did….they were just concerned about me, too. That was then. So amidst all of your other great musing I noticed you are a DVC member. Cool. I was a teacher (until about a month ago when my daughter was born) and it is the PERFECT profession for mamas. 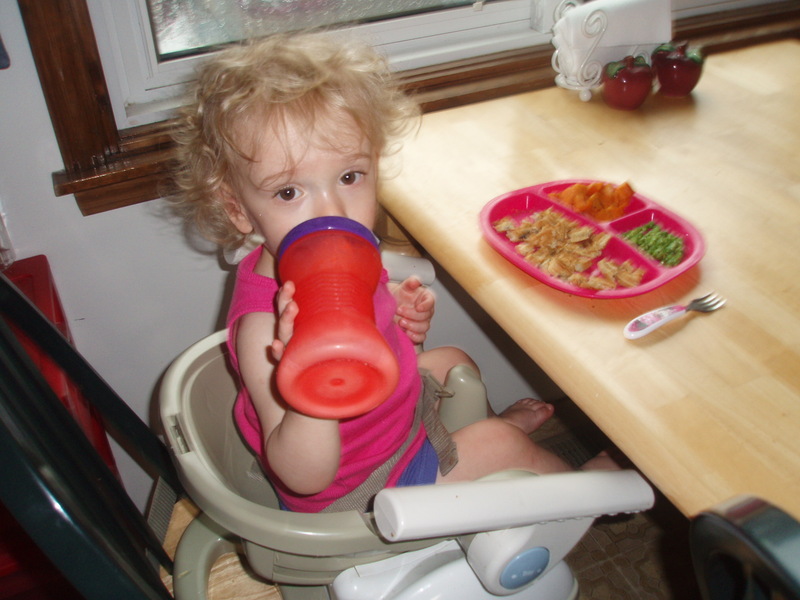 I hope to go back when my daughter (and hopefully more children…we had some trouble getting pregnant, too) goes back to school. Definitely the best profession for working mamas! Great hours, great sick leave, and once they’re in school, same vacations! What grade do you teach? I teach 2nd this year(for the 3rd year in a row), but I’ve taught Literacy, Kindergarten, and 3rd grade previously. I struggled so hard with deciding how to tell you. Obviously, I was ecstatic that I was finally pregnant, yet my heart was breaking for you. I figured that a text would allow you to digest the news (I knew you would be thrilled, yet I also knew first hand how pregnancy announcements would make me feel sad for myself..wondering if I would ever get to announce my own pregnancy). I remember crying on more than one occasion when someone would announce their pregnancy..it was bittersweet..I’d be legitimately happy for them, yet it made me feel like my heart was breaking in a million pieces because it’s something I wanted so desperately. I seriously had your best interest in mind when I decided to text you, and not call instead. I remember even asking girls on an Infertility board what the best way to break the news to someone else who was going through treatments was, and the consensus was a text. Oh, I know! I didn’t mean to make you feel bad! I understand why you did it as a text!! It was for the best. But, looking back, it’s kind of funny sort of news to text to someone. 🙂 Don’t feel bad! I honestly don’t know what I would have done if our rolls were reversed. It was kind of nice (in retrospect) to not be the first of the two of us because I didn’t have to make that decision.